When our first Italian Greyhound was about three years old, we decided he needed a playmate. Moose enjoyed the playdates we attended, so we thought he might like a canine companion at home, as he had formed a close bond with our chronically ill cat. By now we knew about the evil puppy mills behind the cute pet shop puppies. We opted to rescue our next dog. 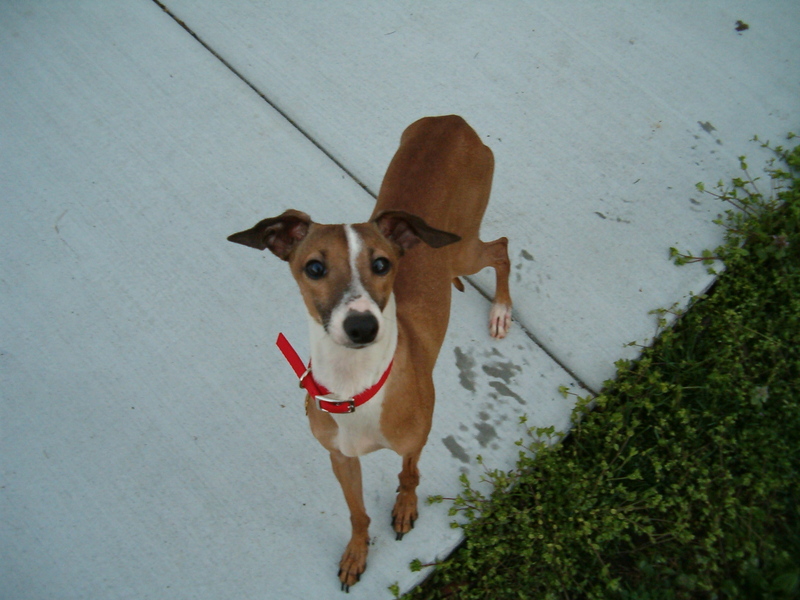 Through Petfinder we found an Italian Greyhound in the care of a central New Jersey animal welfare society. His profile told one story, but the organization told us quite a different tale once we arrived to meet the dog. The pup was being held at a private home. It was a noisy environment; we were greeted by barking dogs and screaming kids. Knowing this sensitive breed, it wasn’t a good place for an Italian Greyhound. His name was Red, and he had zero interest in meeting us. In fact, he was under a table and wouldn’t come out. Even the lure of meatballs wasn’t enough to convince him to greet us. The table had to be moved, and he needed to be grabbed and brought to us. No kisses, no asking to be petted, nothing. Just shaking. I thought I heard his teeth chattering. The foster mom gave us a leash and invited us to take Red for a walk. Why would he want to do that when he couldn’t stand being near us? Out on the front lawn we walked, my husband holding the leash. A funny thing about this little dog, he couldn’t walk, at least not the way he should. He didn’t stand upright, he walked low to the ground like a crab. He wasn’t in the best condition. His teeth were an interesting shade of green, you could almost smell him before you saw him. He was skinny, even by Italian Greyhound standards. One of his front legs bowed due to a previous broken leg. Red was in poor shape, both physically and mentally. The foster mom told us the real story behind the cute Petfinder photo. Red was “rescued” from a puppy mill by an animal hoarder, so he went from one sad situation to another. We knew Red was more than we could deal with, and not the right dog for us. However, we couldn’t leave him in that chaotic house, worsening his fragile condition. To make matters worse, he had been neutered just the day before and was recovering from that. We paid the adoption fee, the foster mom administered some vaccines, and off we went with a dog who really didn’t seem to care for us at all. We brought Moose on the trip to meet his potential sibling and they got on well. Red was more than we bargained for. I never thought he wouldn’t know about grass, which is why he walked low to the ground like a crab. I don’t think he was anywhere other than a cage in the beginning of his life. He learned from Moose how to play in the yard. Our other dog also taught him how to use stairs, because Red didn’t know how to get in our house when we brought him home. Red had an upsetting habit of growling at my husband, complete with raised hackles. He would also follow him and bark whenever Ted moved about the house. Sometimes he nipped the back of his legs, drawing blood a time or two. If Ted tried to put a leash on him, Red would launch himself into a wall to get away. I had taken three days off from work to get Red acclimated to the family. All Red did was growl and bark, which brought me to tears. I wanted to love him, but I didn’t like him at all. We took Red to our vet, a fellow Italian Greyhound owner. Red was red fawn in color with a black mask, approximately 1 to 2 years old. I was surprised he was so fancy, I just thought he was brown. We got him microchipped because who wouldn’t want a miserable little creature returned to them? He was in bad need of a dental, and needed to gain weight. The vet confirmed his leg issue, it was broken at one point and was never set. The bones fused together to form the irregular shape. Tests showed he had a parasite called giardia, which meant both dogs needed to be treated. Once Red was repaired medically, we attempted to fix his damaged mental state. We tried trainers, behaviorists, and even a pet psychic to get to the bottom of Red’s issues. Red has been a member of our family for 10 years this April. He still follows his daddy around the house barking. He only does this when my husband is standing or walking. If he’s sitting down, Red is curled up beside him. If we’re out of the house, Red acts normally toward him with no barking. It’s the strangest thing. As annoying as Red’s barking is, this bad habit saved his life. When his voice changed to a muffle we knew something was wrong. He was also having difficulty breathing. Another trip to our vet diagnosed a salivary mucocele, a benign growth so far back in his throat that it blocked his airway. Red had surgery to remove the salivary gland at an out-of-state veterinary hospital and his voice returned to normal. At first Red was a mistake, but over time he turned into a loving little dog. He does go for walks and playdates although I know he prefers to stay home. He and Moose love each other, and Moose taught him how to be a dog. It took Red a while to play with toys, but now he carries one wherever he goes. Red is more crazy than Moose. He’s always doing something to make us smile. His exact age and birthdate are unknown but, as with Moose, we hope we have many more years together, and forever wouldn’t be long enough. Red also answers to Reddy, Reddywhip, Whips, Whippers, Snips, and Reddywhippersnapper. Whatever we call him, he is considered family. I love you, Red. 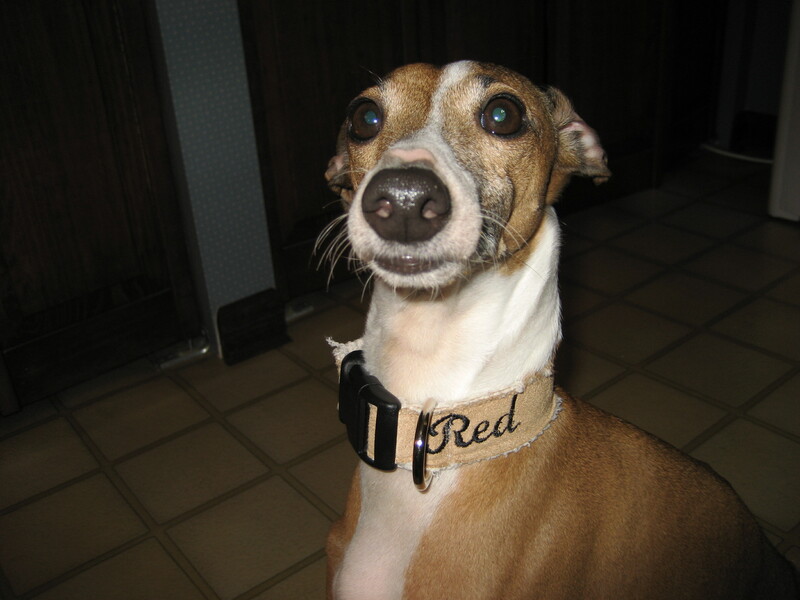 This entry was posted in mirth, pets, red and tagged dog, Italian Greyhound. Bookmark the permalink. Loretta, I was really interested in Red’s history. Our little Yorkie was sort of a rescued dog. My daughter’s in-laws never took care of the dog, no shots, not spade, no grooming and one of the males of the house, who is the age of 5 mentally, used to strangle the dog when it barked. Fate intervened (long story) I have the dog. She is always growling and nipping at my husband and drawing blood, and yet, she also loves to snuggle with him. We are working on her trust issues. She never snaps or tries to bite me. I feel better after reading your story. I would never have guessed he is a greyhound. Such a sad story with a happy ending. Thank you. Thank you so much for the compassion you have for animals, and for giving Red the chance you did! I hope you do indeed have many more years together. Thank you all so much. Marie, we’ll have to trade dog stories sometime.